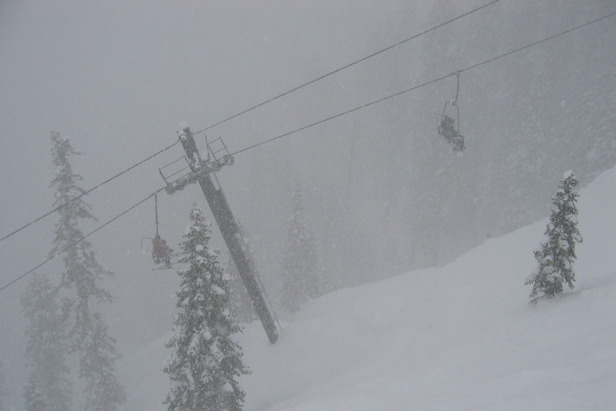 In honour of the season's historic snowfall and incredible spring skiing conditions, Squaw Valley USA has already extended their ski season to May 30, 2011. With a current base of 225"(5.6 metres) spring skiing at Squaw also includes live music, outdoor sundecks, poolside restaurants and more make Squaw Valley the place to be this spring. The resort also offers a mountaintop pool and hot tub overlooking the Sierra and one of the longest ski seasons in the country. With records dating back to 1970, Squaw Valley USA previously beat their highest recorded season snowfall total of 662 inches during an epic March snowstorm that brought 211 inches (17 feet) of snow to the resort. Now having reached the 700 inch milestone, the resort has greatly exceeded the average annual snowfall total of 450 inches. More snow and phenomenal spring conditions are on tap in the next eight weeks until the season end. "With 700 inches of snow, we are going to have amazing spring skiing through our extended closing date of May 30," said Andy Wirth, Squaw Valley's Chief Executive Officer. "We have so much snow that we will be examining the possibility of opening for the 4th of July, conditions permitting." Skiers and riders can take advantage of the abundant snowfall with a Spring Pass for just $199. The 2011 Spring Pass is valid seven days a week through to the newly-extended end of the 2010-2011 winter season. After May 8th however the resort will move to Friday-Sunday operations, offering skiing and riding May 13-16, May 20-22 and May 27-30, 2011. Additional days of operation include Monday, May 16, for the Stage 2 start of the Amgen Tour of California and Monday, May 30, the US Memorial Day holiday.